La Commedia Sotterranea della Macchina da Scrivere is a gathering of verse fragments and collages describing and illustrating the life of the Typewriter Underground, a spontaneous sub-cultural phenomenon that appeared with near simultaneity in a variety of cities and smaller locales across the globe in the late 20th and early 21st Century. 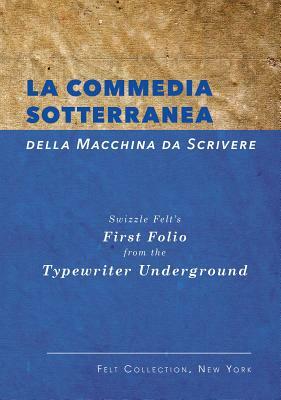 The Commedia (commonly referred to as "Felt's First Folio from The Typewriter Underground," a private publication putatively issued by Swizzle Felt, an early participant in the Underground and an avid collector of its ephemera) offers a lively picture of life in this subterranean community. The verse fragments appearing in La Commedia have the quality of the early gospels--personal accounts of authors who lived contemporaneously with the Underground, and were among its early apostles.